To compile a list of the 'finest' in any category is a tall order. In the case of art, it borders on the impossible. There will always be debate about which works make the cut and how some just do not fit into a top list. In order to fulfill this overwhelming task, I listed the names of the works of art from the top of my head, as they came along - this took me about under a minute. The methodology used, therefore is simple: Top-of-mind recall. 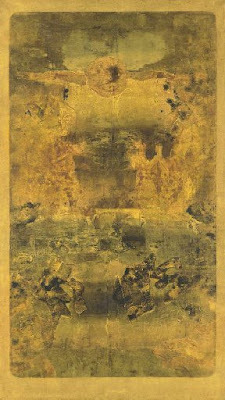 Gaitonde is amongst the most powerful artists to have lived and this particular work is probably the master’s finest. With its complex multilayered forms and rich earthy palette, this work offers the viewer a portal to an undiscovered ethereal spiritual realm – ever-expanding in depth and impossible to fully unravel. Oil and mixed media on canvas # 70 1/8 x 42½ in. Created in reaction to reports that French soup-kitchens were using pork as an ingredient to deter Muslims from partaking in the meals, Very Hungry God was a break-through piece. Though Gupta had created powerful work prior to this object, Very Hungry God turned the world’s attention in his direction. 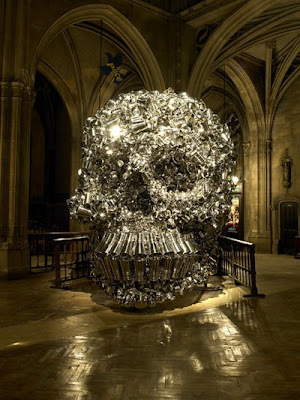 The sight of this stunning object displayed in the Eglise Saint-Bernard de la Chapelle et Square Saint-Bernard in Barbes, Paris during the Nuit Blanche (an annual all-night cultural festival) is unforgettable. This work was seared permanently in our collective memories following its placement on the Grand Canal in front of super-collector François Pinault’s Palazzo Grassi during the Venice Biennale. 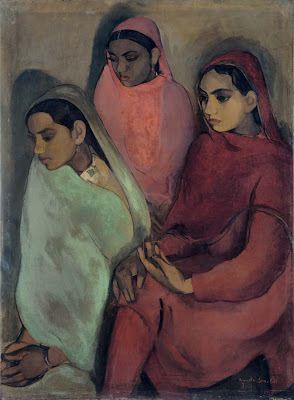 Though I believe every work created by Sher-Gil is a gem, Three Girls is particularly special as it belongs to a period and body which mark a discovery of her own painterly expression - a shift from the trained to a personal language. The demeanor of resignation and the repressed expressions of her subjects are captured in a remarkably touching and sensitive manner. Mahishasura garnered tremendous attention, courtesy the record winning bid for an Indian artwork in auction at the time. In this work, Mehta’s signature taut, measured lines and unconventionally balanced palette depict the slaying of the buffalo demon Mahisa by Goddess Durga. 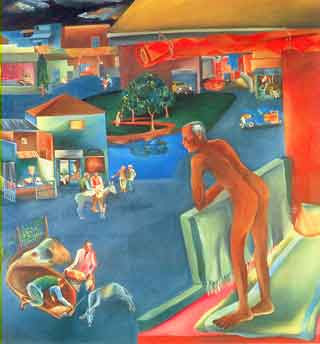 Amongst India’s finest and most sensitive artists, Khakhar’s You can’t please them all was a monumental statement, offering an autobiographical insight for the viewer into his life. Though there was a tendency to slot his works into the stereotypical ‘homosexual’ category, his practice combined irreverence with a rare honesty which gave his works a powerful and contemporary edge. You can't please them all # c. 1982 # Oil on canvas # 69" x 69"
Dodiya is amongst the leading artists who heralded the contemporary Indian art movement – not following trends but finding their own voice and expression. His work is rooted and affected by events. Bombay Buccaneer was a result of introspection and questioning the validity of his own practice. 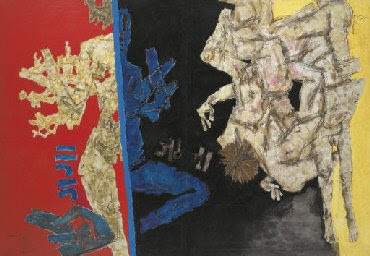 This seminal work was part of a body of 29 canvases exhibited at the 11th Bienal de Sao Paulo. 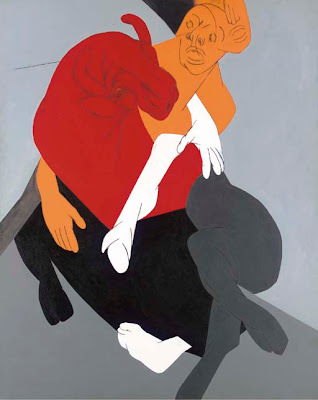 It marked Husain’s first interpretation of the Mahabharata which he revisited again in 1983 & ‘90. This particular title was the cover lot in the historic Herwitz Collection sale of c. 2000 conducted by Sotheby’s. 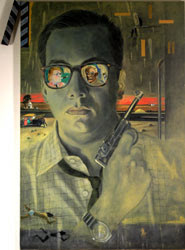 Originally from The Chester and Davida Herwitz Collection. A brilliant draughtsman, Souza’s portraits of the powerful are in my estimate the most collectable from amongst his preferred subjects. They powerfully rendered the hypocrisy and duality of the elite – expensive dressage which does little to conceal their wretched reality. Titian’s Grandfather is an epitome of Souza’s exceptional practice: brutal lines and demonized human studies. 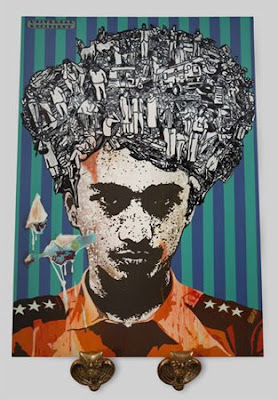 The Petro Angel series comprises 6 large-format canvases which were presented at the 52nd Venice Biennale. These works capture an Iranian actress (from ‘Circle’, directed by Jafar Panahi) in a pensive, contemplative mood. This body of work is a strong comment on the world and times we live in. The female protagonist faces multiple hardships and a defined dual-challenge: that of being a woman in an Islamic nation; which is ravaged by internal strife and turmoil. Displayed at the Arsenale at the 52nd Venice Biennale. This series by Kallat, who is amongst the most prodigious contemporaries present the portraits of Indian men, which carry a potent duality. His subject is the everyman whose drab existence you can read off his appearance yet the presentation is bright and celebratory in tone. A powerful body of work, these along with a selection of installations and paperwork were part of his first solo exhibition with the Haunch of Venison in Zurich in 2008.